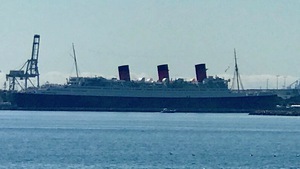 In the heart of the pier at Long Beach, California you will find the Queen Mary docked. This ship was in service from 1934 to 1967 as a British ocean liner. Present day it is used as a hotel. The Kumachan is sponsored by Wakikele Rental.